Love it or hate it, PHP is part of the core fabric of the web, driving blogs, services and corporate sites of all sizes. 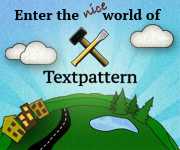 Textpattern is no exception. The CMS core code is deliberately kept as light and airy as possible, striving to keep out of the way of the process of creating and managing great content. Instead of piling features in, Textpattern prefers offering hooks so that other code can extend the core with PHP. If the thought of dirtying your hands in the squiggles and brackets of a programming language sends you running for the nearest shower, you might be surprised how easy it is. Thanks to Textpattern’s flexible tag system, site designers are already well versed in the concepts of conditional logic. The leap to writing a fragment of code to make you or your clients’ life easier is just a small step further. To bring this magazine to fruition required gently twisting Textpattern from managing linear date-based or date-independent content into clusters of easily navigable, issue-based articles. Although fairly straightforward, it’s not as simple as it sounds, and took a few waves of the PHP wand to accomplish—some TXP Mag(ic), if you will. Several plugins stirred into the cauldron also made the workflow simpler from the inside for the editorial team. So put on your pointy black hats and find out how the spells were cast to turn the magazine you’re reading from an outline drawing of a frog into a curvy princess. Click click click click. 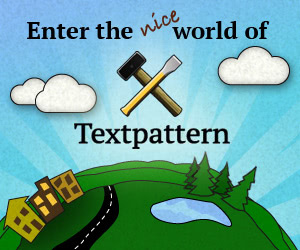 That’s the sound of people using Textpattern’s admin interface and navigating to things they’ve recently edited. Wouldn’t two clicks help ease wear on your mouse, as well as saving time and frustration? Fear not: there’s a plugin that does just that: adi_recent_tab. "[B]eing a female has been an advantage for me in the industry, probably because the field is dominated by men. Working with a woman tends to be a refreshing change for people. Mind you, 80% of my clientele does happen to be female! I think women entrepreneurs like the idea of supporting other women in their vocation."